It's been months in the planning and execution, but Coni Grant and I are so proud of the work we've created for Phantom Canyon Brewery and Restaurant in downtown Colorado Springs. This show will be up for June and July. See our largest and most colorful paintings yet as you hoist a cold one and enjoy the restaurant's excellent cuisine. Coni has been my cohort this spring in Creede at the quick draw paint out and she will also be my featured artist at 3rd Friday ART Walk in Manitou at the Gallery. She will demo a painting that evening, so stop on in and meet her! Then on Saturday June 22nd, Coni will be teaching a one day workshop hosted by my neighbor gallery, Fare Bella. To sign up, contact me through the website. 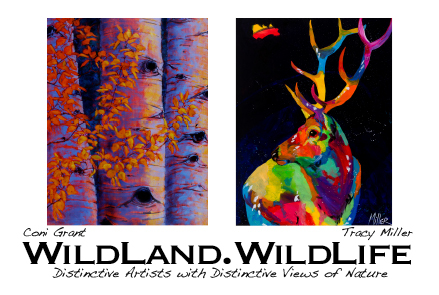 I will be in Jackson that weekend to participate in another quick draw at the National Museum of Wildlife Art! Watch for a future posting on that event and the painting I create for it. Hope your summer is off to a great start!